Naomi Striemer went from milking goats and gathering eggs in Nova Scotia to signing a multimillion dollar record deal with Sony Records at 18 years old. She went on to have a #1 single with guitar legend Carlos Santana and was hailed 'The Commanding Diva of the Decade' by Billboard magazine for her 'melodic debut of the year'. She worked with Marius DeVries (Madonna), Peter Zizzo (Celine Dion), Mario Winans (Beyonce, Puff Daddy) and even American Idol's Randy Jackson before one moment in 'Daddy's House', a studio owned by Sean Combs in the heart of Manhattan, changed her life and career forever. After a dream from the Holy Spirit, Naomi walked away from her pop career, her contract, her 'once-in-a-lifetime' opportunity to see what Jesus had in store for her, and God has been using her ever since. 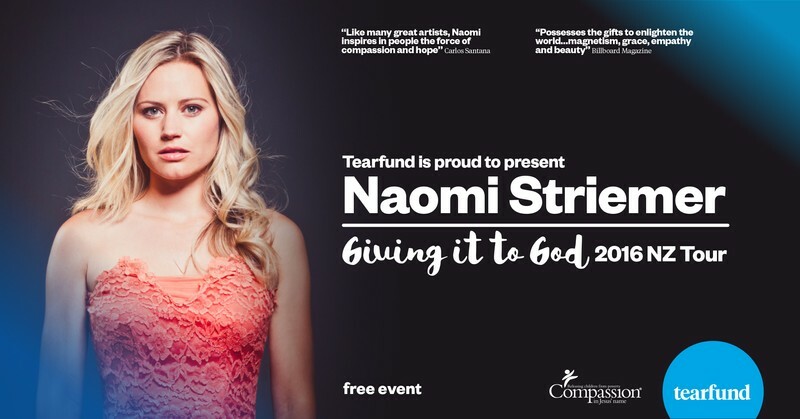 We are excited to be bringing Naomi to New Zealand this November for the Giving it to God 2016 Tour. Join us as she shares her music, her story and her passion for the work of Tearfund through Compassion to set children free from poverty in Jesus' name. The Giving it to God Tour kicks off in Auckland on Friday 29th October, before heading to the South Island and Lower North Island. See below for the full tour schedule.